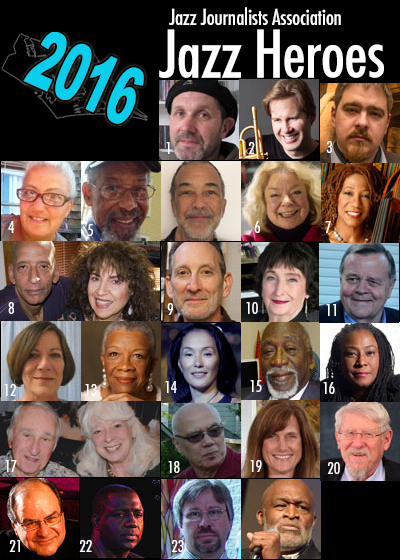 Final round voting has begun for the winners of the Jazz Journalists Association's 2016 Jazz Awards. Finalist nominees in 41 categories of musicianship, recording and jazz journalism and media were announced today, April 22. Nominations were made by JJA members and finalist nominees were named on the basis of number of nominations received. Winners in the music and recording categories will be announced on the JJA Jazz Awards site on May 15. Winners of the media awards will be named at the June 15 JJA Awards party at the Blue Note Jazz Club in New York City. The Jazz Journalists Association's annual Jazz Awards party, celebrating the winners of the 2016 JJA awards for jazz musicianship and media, will be held June 15 at the world-renowned Blue Note Jazz Club in New York City. New York City – More than two dozen "Jazz Heroes" -- activists of positive influence on their musical communities -- have been announced today by the Jazz Journalists Association, a non-profit organization of media professionals, in collaborations with grassroots groups and supporters in 23 U.S. communities.